Dear friends , this school year my daughter has to learn about the Stone age with all its subdivisions - the Palaeolithic, Mesolithic, Neolithic and Chalcolithic Ages! It can get pretty confusing trying to remember what happened during each age!! But kudos to the clever History teacher who asked the children to make a chart, a powerpoint presentation or a model on an assigned age! 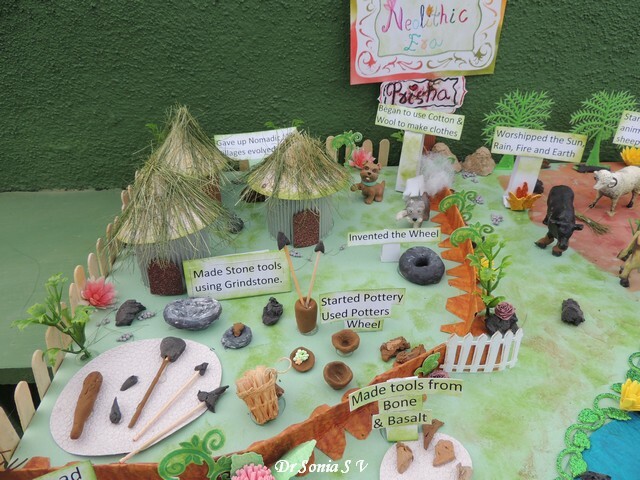 My daughter got Neolithic Age, and of course, if you have been following my blog for sometime you will guess correctly that she opted to make a 3 D model rather than an easier chart or powerpoint presentation!!Haha!! 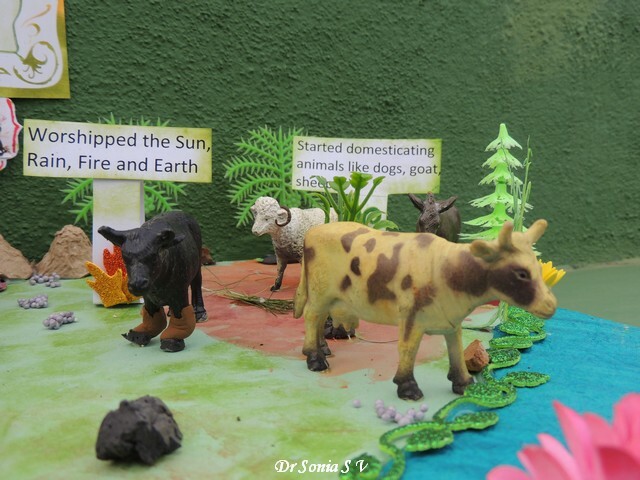 We planned out the elements in our Diorama such that each unique and important aspect of the Neolithic Period was highlighted. The main reason I am sharing this project in so much detail is that it may benefit someone in future...When I googled about this period I found there was hardly any school project type material online!! And for my crafty friends....well do sit back and be transported back into Neolithic Age!! During the Paleolithic Age which preceded the Neolithic Age , men were predominantly nomads hunting for food and living in caves. 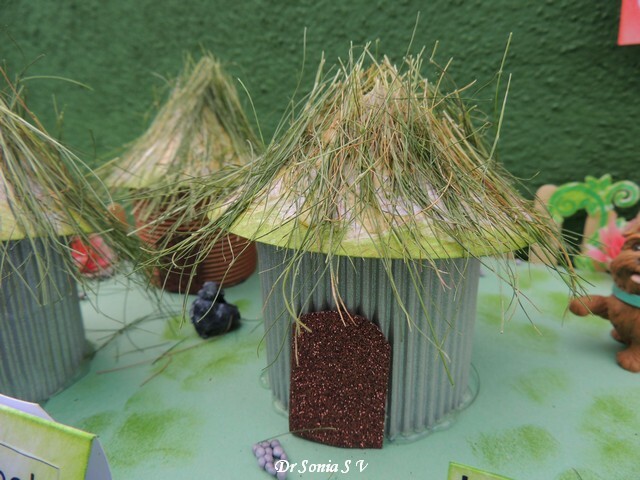 During the Neolithic Period they started farming and settled down in small fenced villages and built homes with thatched roofs. The type of tools used is distinctive in each age . During the Neolithic Period , sophisticated stone tools evolved. My daughter made all the tiny tools referring to pictures of Neolithic tools in her textbook and online. 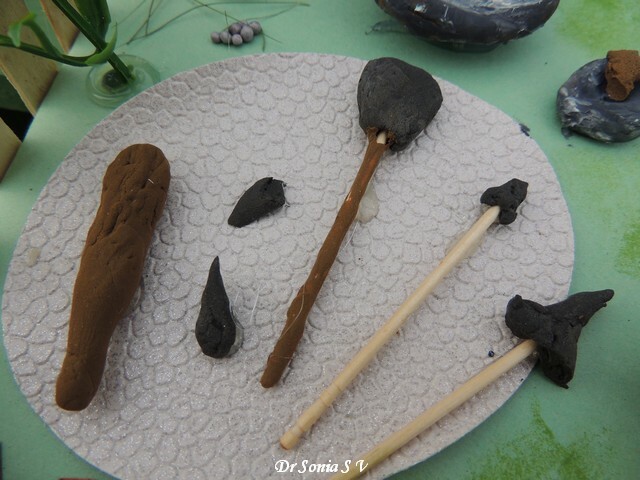 She molded the tools using air drying clay and added "toothpick" handles to some of the tools as "handles" were a hallmark of Neolithic Period stone tools! Neolithic man could make more polished tools compared to his predecessors as he made use of the "grindstone" to smoothen and shape his stone tools! 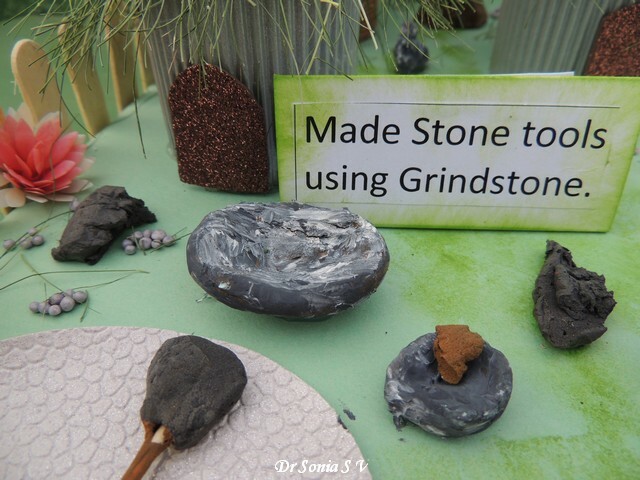 My daughter's grindstone was fashioned with clay which she painted with acrylic paint to give the "stone look"! Neolithic man also used "basalt" ...a type of stone which did not chip easily and hence could be shaped into finer stone tools. 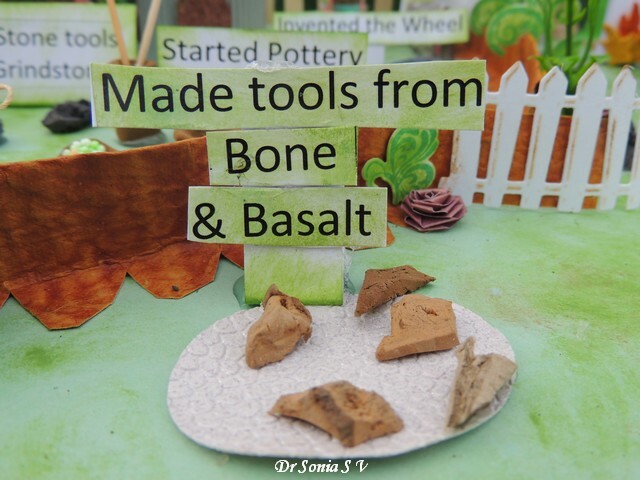 And in the picture below you can see the "bone" tools my daughter fashioned by cutting clay which had dried up! During this period man discovered fire and pottery! 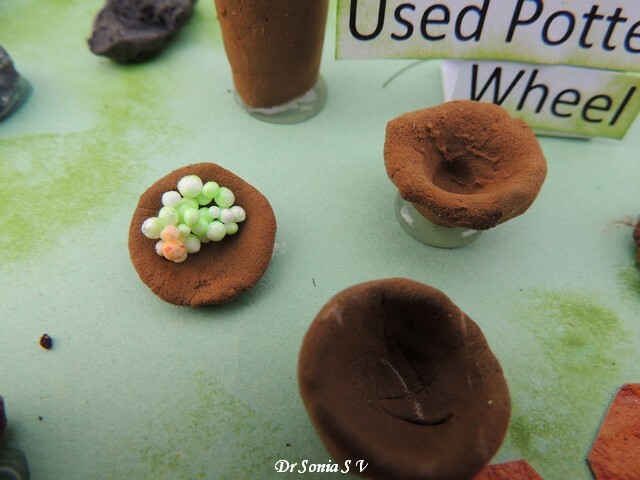 And my kiddo was sooo proud of all her little pots and vessels she made painstakingly! 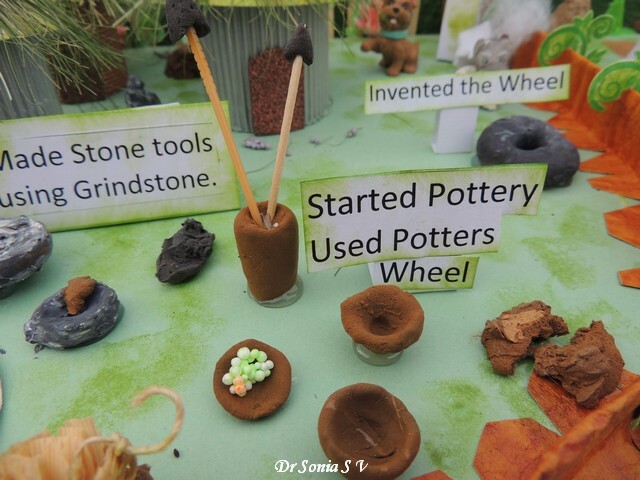 She added all kinds of little details like the "mound of clay" on the side besides the pots from which the pots were made! 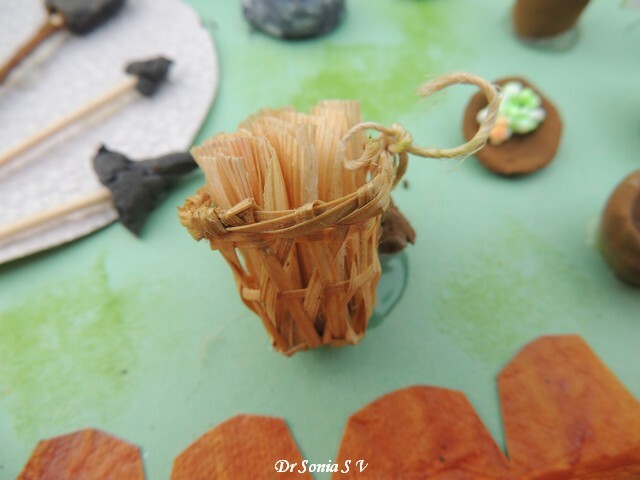 And we added a toy basket as Neolithic man were expert at basket making!! 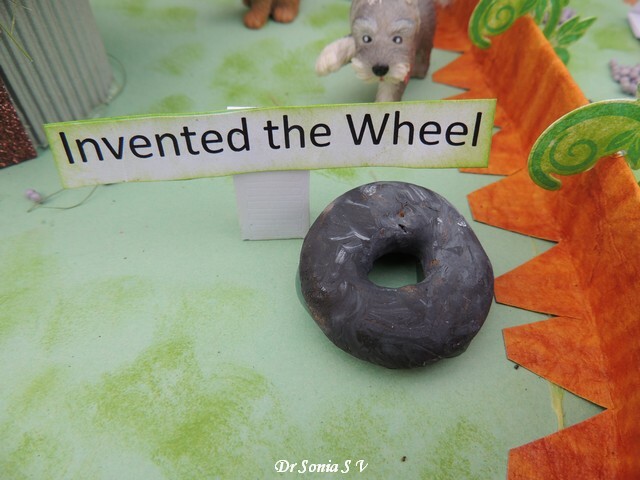 The invention of the wheel happened in the Neolithic Period ...and they made the wheels by carving stone!! Just imagine! And the major points differentiating the Neolithic Period from the Paleolithic Period....cultivation and domestication of animals! It is times like these where I am soo glad I have a nice stash of craft supplies I can fall back on to make a project quicker and easier! We could use dies to quickly and easily add a lot of plants to our diorama! 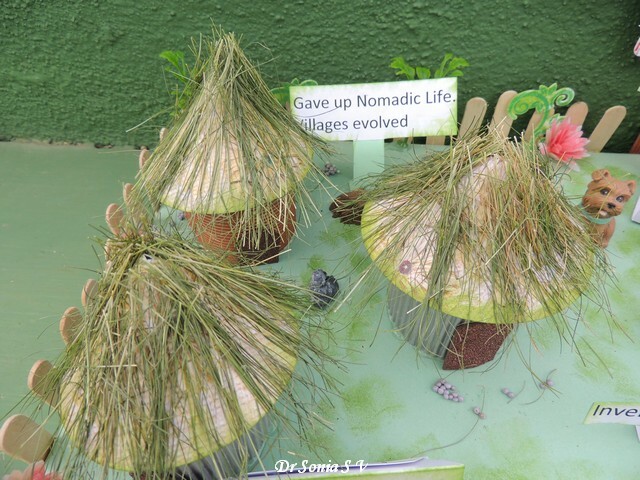 Neolithic Period man cultivated rice, wheat and barley. 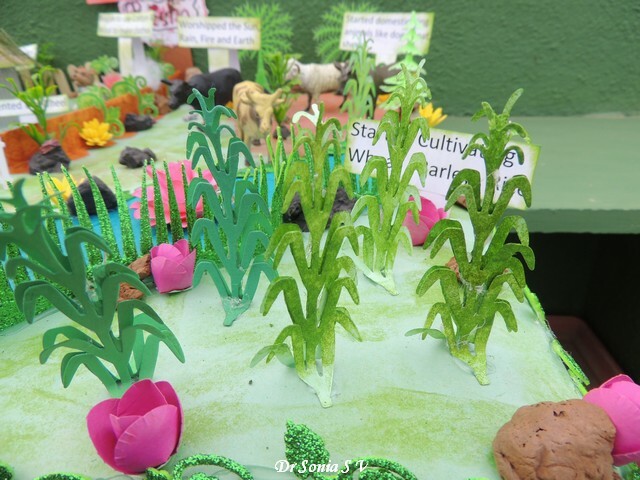 Our diorama has maize plants but then I guess that's okay!!Hehe! Neolithic man settled down near rivers and streams and our deep blue stream is bordered by glittery reeds and vines! Th muddy mound you see near the flower is a lump of clay!! Turned out sooo realistic ! 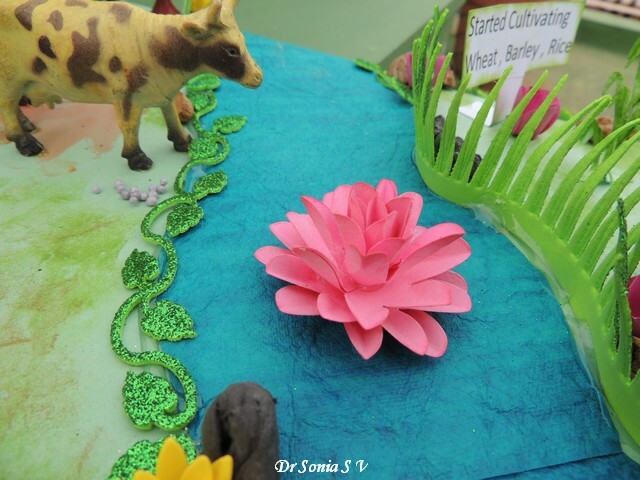 Most of the objects in the diorama were created by my daughter with help from me for the hot gluing aspect but I couldn't resist contributing bits here and there and one of them is the lotus! [here is the tutorial : Easy Flower Tutorial ] ! 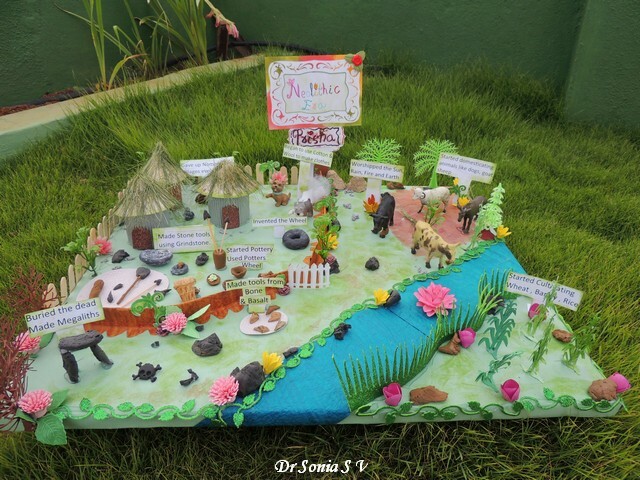 My kiddo painted the muddy patches and grassy terrain for her animals. And boy was this an educational as well as a fun project! 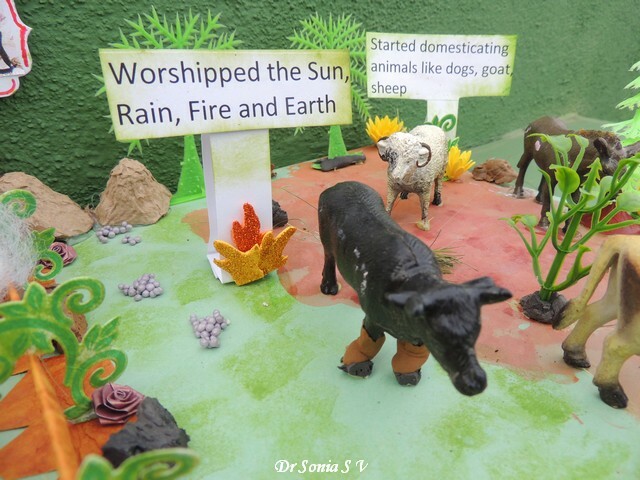 And can you spot the "socks" on one of the cows...well that poor chap had his legs eaten off by my dog when he was a puppy ...but the good news is he can now happily stand on prosthetic clay feet [created by my daughter] ! 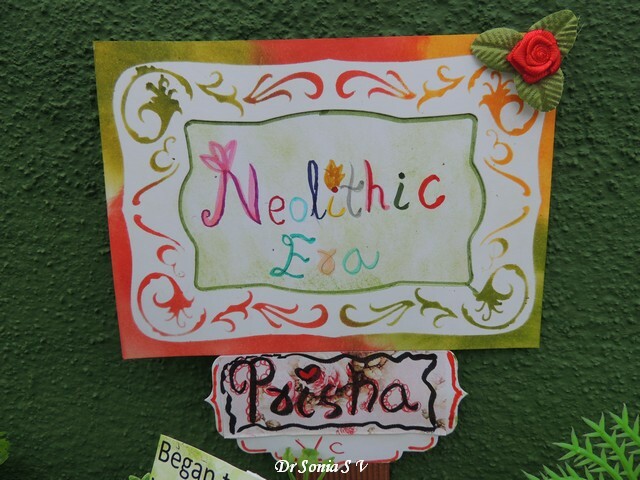 We had signs put up to highlight each important aspect of Neolithic life and my daughter used glitter foam to depict fire! The little rocks you can spy right at the back behind the sign was the carton packaging of eggs! !Hehe yeah we used a lot of recycled objects in this project! 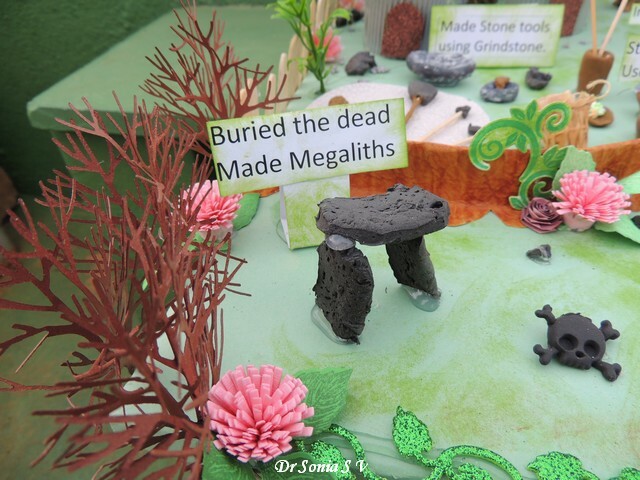 It is always fascinating to read about religious practises and I was so surprised to read that Megaliths [which are huge stone boulders used to mark burial sites] can still be seen in my home state of Kerala , near the popular tourist town of Munnar! Our project took a good many hours to complete but boy my daughter was sooo proud of it ! And the best thing is that I think she will remember all the important facts of the Neolithic Period for a good many years!! 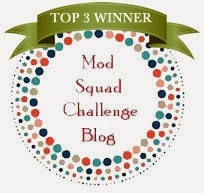 Edited : This project was featured at the Pixie's Snippets Playground - Thank you so much Di !! 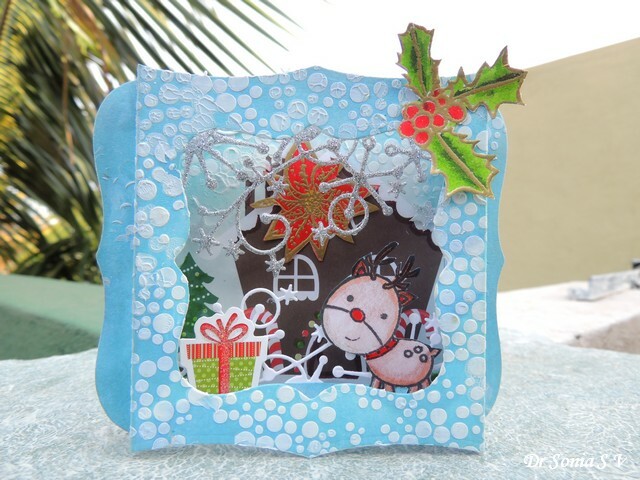 Hi friends so excited to bring to you my first Guest DT post for Rudolph Day Challenges! 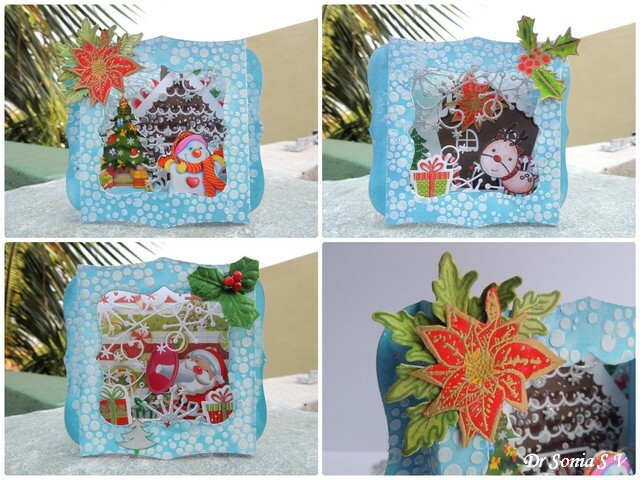 This Challenge is very special to me as the theme is always Christmas and I looove making Christmas projects!Thank you so much Maureen for having me as your Guest DT. 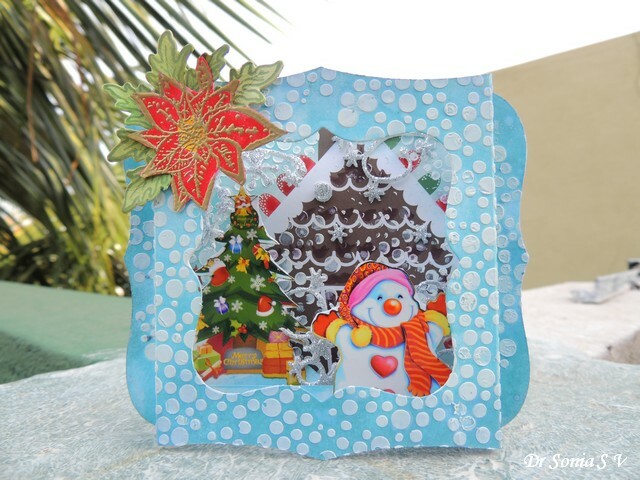 My first Diorama Card has a little scene with a gingerbread house in the backdrop, sparkling silver glitter foam snowflakes hanging down, a decked up Christmas tree and the star....a cutie snowman waving Hi! 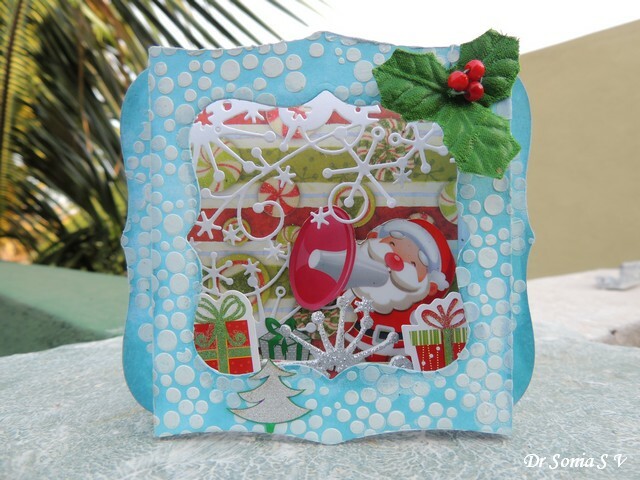 The 2nd Diorama Card has our Jolly fella, Santa bringing presents! There are snowflakes hanging down and rising up from 2 layers of the diorama. 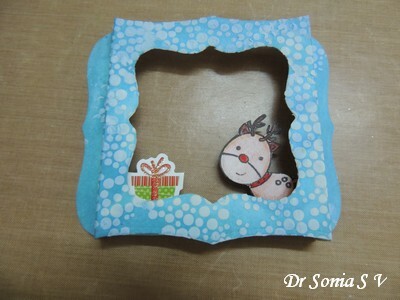 And being a Rudolph Day Challenge .....I just had to make a card featuring an adorable reindeer! Rudolph has brought some presents to the ginger bread house! 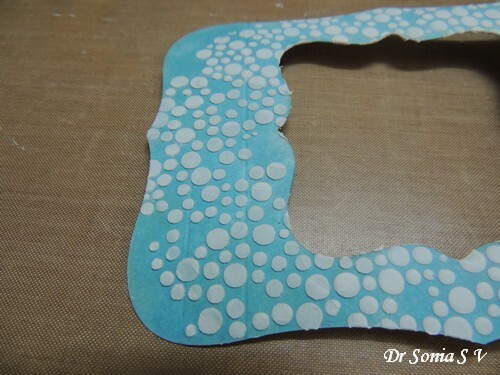 And here is a closeup of the faux snow on my diorama made using texture paste and a stencil! 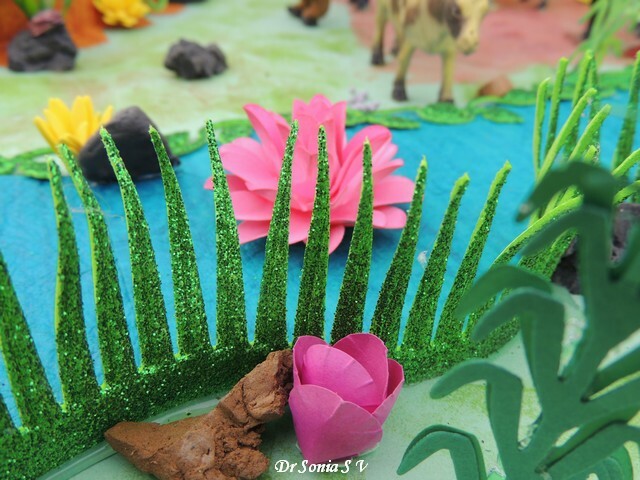 These Mini Dioramas were so easy to make and I made all 3 in an evening! 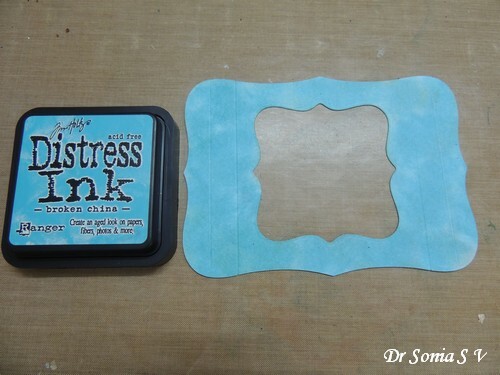 Die-cutting : You can use any shaped die you like......and they need not be nesting dies either! You basically need one die to cut out the base and front of the card and another die to cut out an aperture . 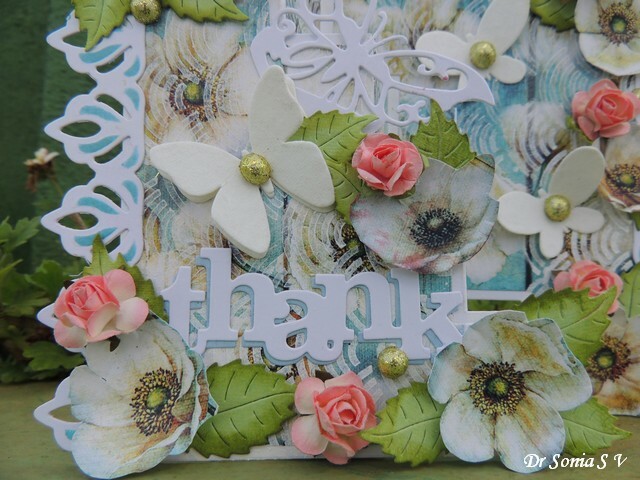 Embellishments- die cuts, stickers, stamped images ....or whatever you fancy! 1. 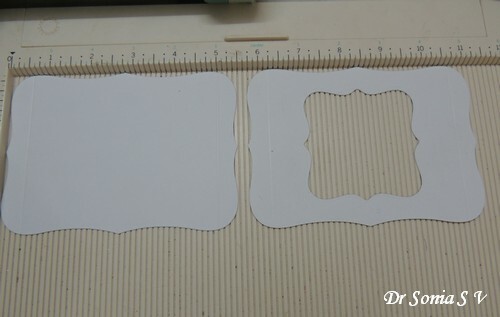 Cut out 2 frames- one will form the base of your diorama and one will form the front part from which you will cut out a window. 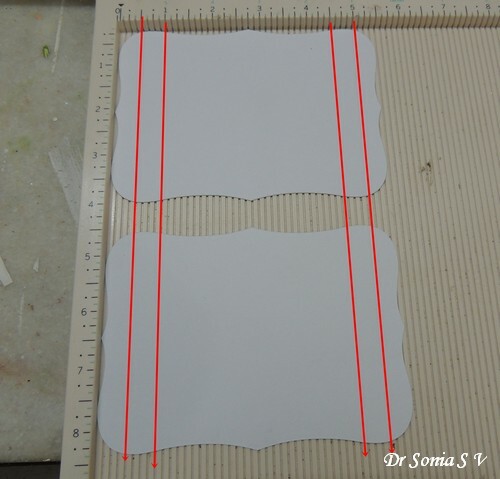 2.On your die cut/ handcut frames- score 2 lines 1/2 inch from the edge and from each other on either end as shown above. For my set of cards I used the largest die from Spellbinders Labels 8 die set and my score lines fall at 1/2 inch, 1 inch , 4 1/2 inch and 5 inch. 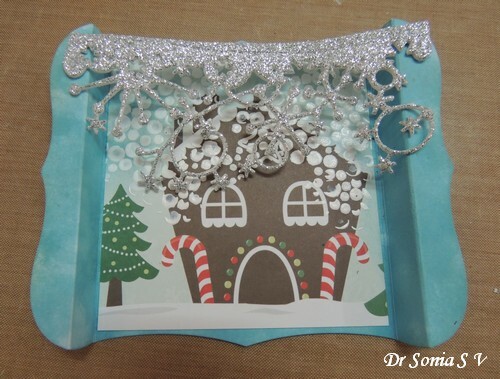 4.You can dress up the front of your card with pattern paper but its easier to ink it up ! 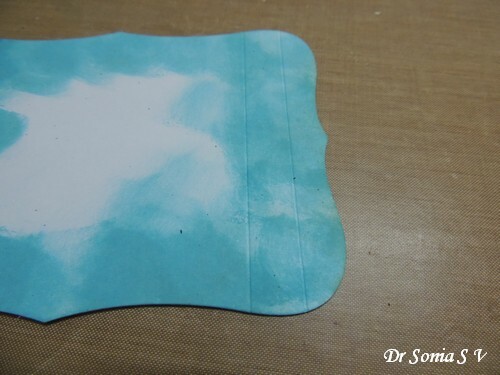 5.Fold the front frame of your card : Once your texturing is dry...valley fold and mountain fold your score-lines as shown. 6. 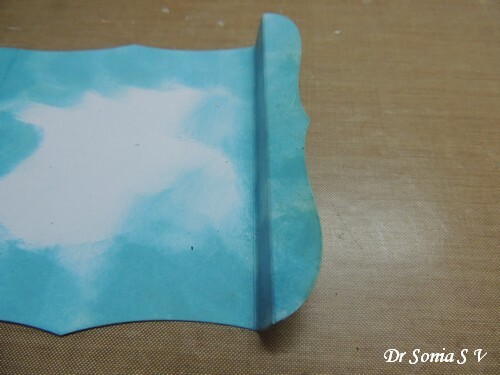 Fold the base of your diorama : Here the folds go in the opposite direction.... as you can see in the picture below. Valley fold the inner score and then mountain fold the outer score line. Do this to the score lines on the other end too. 7. 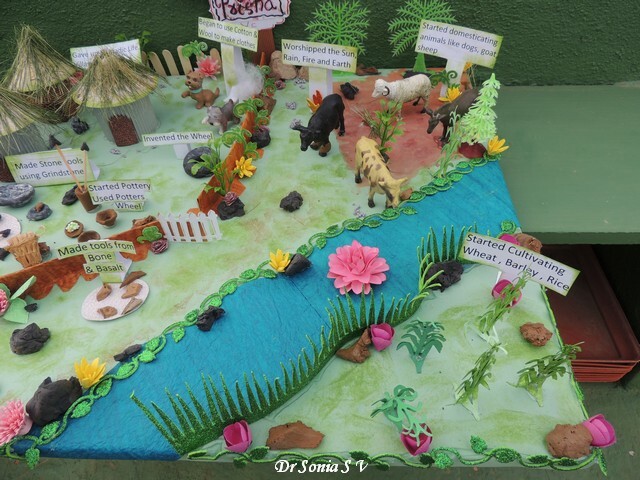 Now have fun designing your diorama...You can make it as complicated as you want by adding multiple layers or keep it very very simple!! 8. 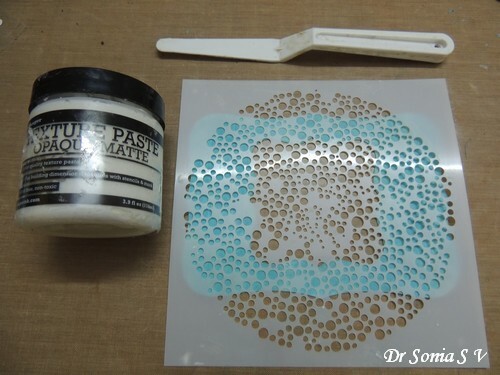 Decorate the base of your diorama : You can stamp/ draw/ use stickers or whatever you fancy to dress up the inside of your diorama card. 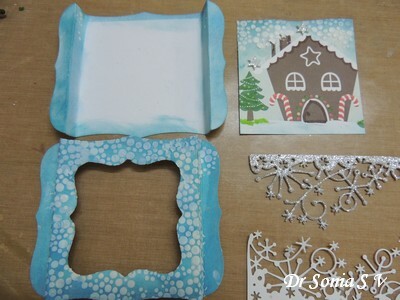 I used a DCWV pattern paper with a gingerbread house design on it and stencilled it with the same stencil to create a snow fall effect. 9. Add a layer to span across your diorama using a strip of cardstock or a die-cut border longer than the central part. 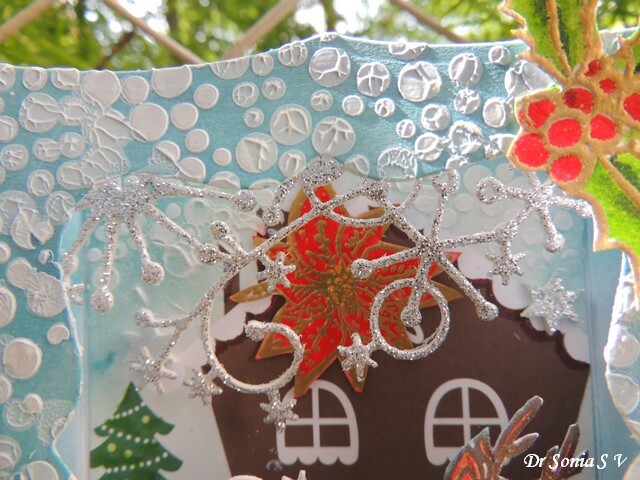 In these Christmas themed Diorama cards I used the Memory Box Frostyville border die cut in glitter foam to span across the top of my diorama card. 10. Optionally add more layers on to the front and back frame! 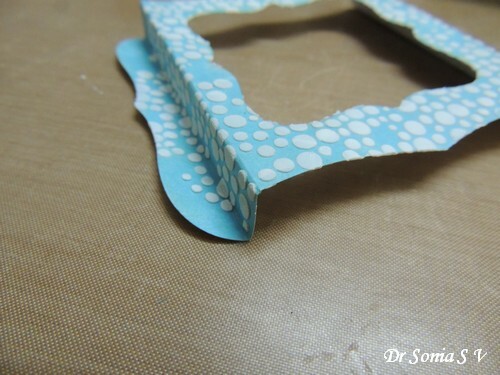 If in addition to the "easy to add" central layers , you want to add more layers, take a strip of cardstock which is = length of the central part + some extra on either end to act as small tabs. 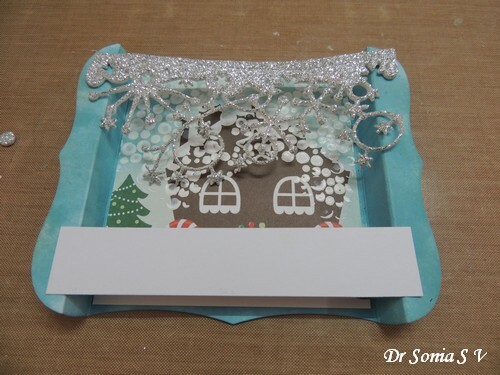 Add your diorama elements,[ which in my card are the stamped Rudolph and a "gift" ] on to this strip of card and stick it to the front /back frame using the tabs on the ends of the card strip. Here you can see the layers of the diorama card! 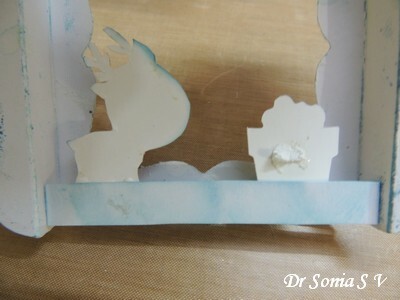 Once you have decorated the back frame and added all the layers you want stick the front window frame onto your base by apply glue on the shelf. 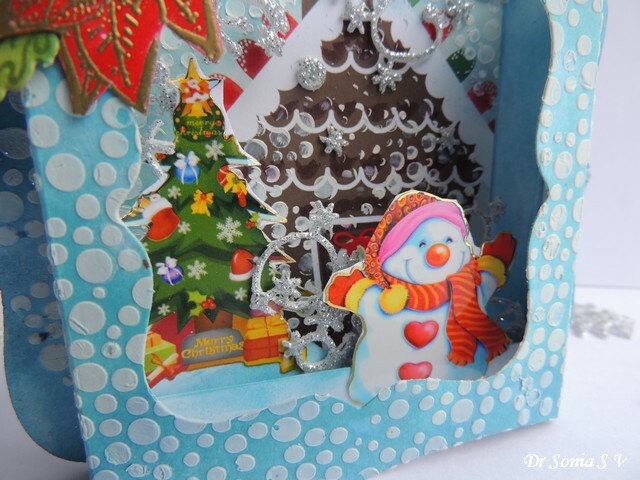 Decorate the front of your card if you wish and your Mini Diorama Card is done!! 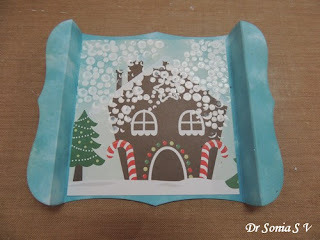 Hope you enjoyed the mini Christmas Dioramas and liked the Tutorial ! Hi friends ,sharing a framed shadowbox with handmade roses I made as a home decor item for our home! One of my crafty resolution for this year was to create hand crafted projects for our home and I am happy I have been successful so far in this particular resolution!! Another crafty resolution was to use my existing craft supplies more. 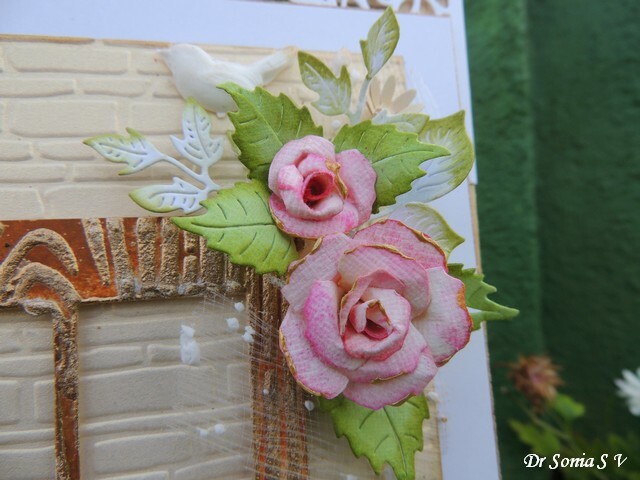 My Tim Holtz Tattered florals die had been neglected for quite some time so dug it up and created the shabby style rose using it! Can you spot the little bird hidden amongst the flowers?...It was made using air drying clay ....I love how a mix and match of different media can make a project so much more interesting to look at! 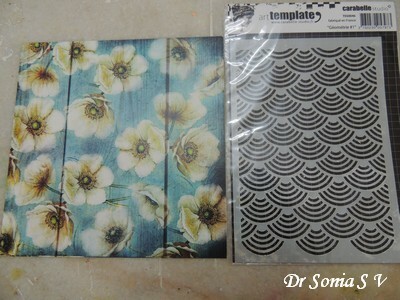 I am still continuing my love affair with Stencils! 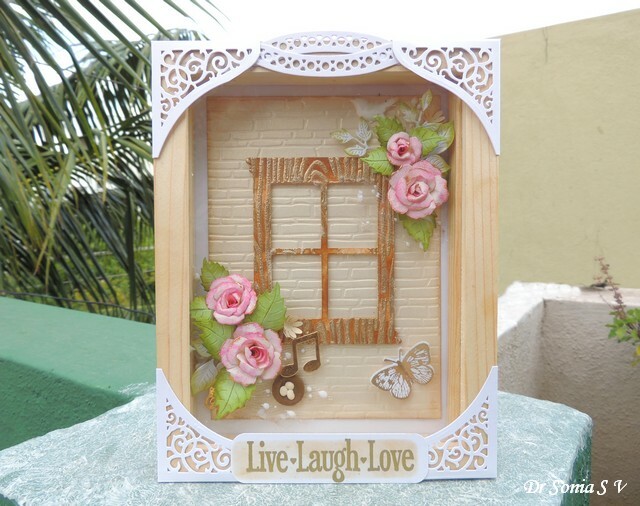 I used the Carabelle Studio Effet Bois stencil and Texture White [ it's a texturing medium but quality wise more fluid than Ranger texture paste] to add a wood grain texture on the die cut window. 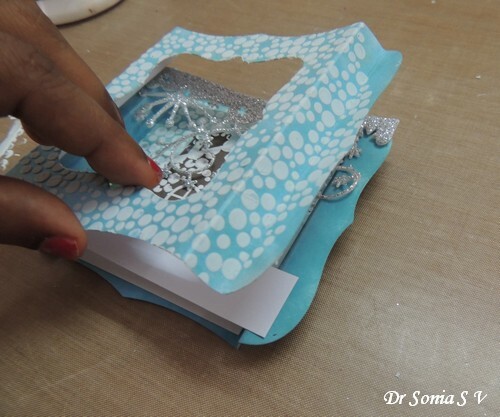 Then added gold embossing powder and heat embossed it. 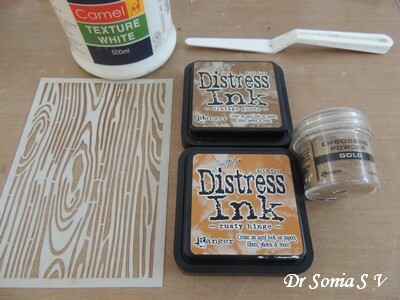 Once the embossed design was dry ..stained my faux wood with 2 shades of Distress Inks for a 2 toned effect. 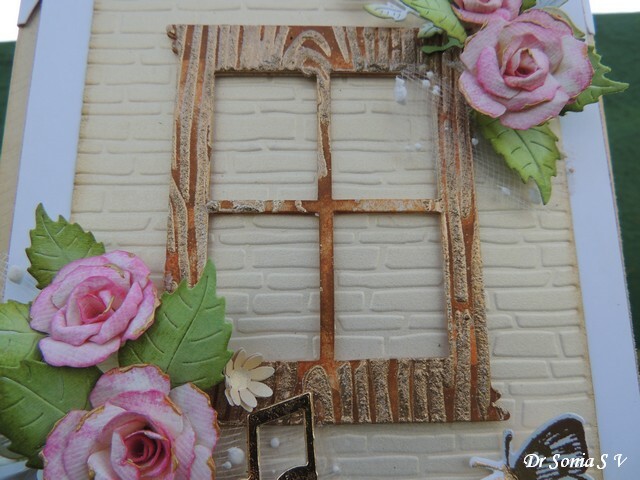 The window has 3 layers popped up on foam and love how it looks on the brick embossed wall! 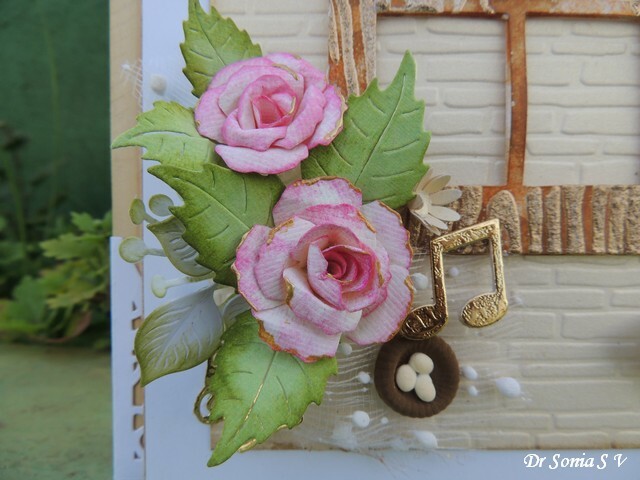 More handmade roses on the lower part of the window and with a golden musical note and a bird's nest made with air drying clay! 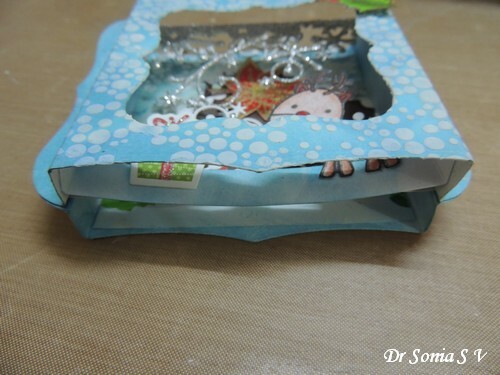 What do you think my crafty friends...It is rather simple but with a touch of loveliness! Hi friends, in India we celebrate Teacher's Day on Sept 5th and every year I try to make something for my daughter's teachers. Most of my daughter's teachers are ladies and flowers are a popular theme so this year too I am going the floral way ! I am in love with the Step Pop Up Card design so this is yet another Step Card. 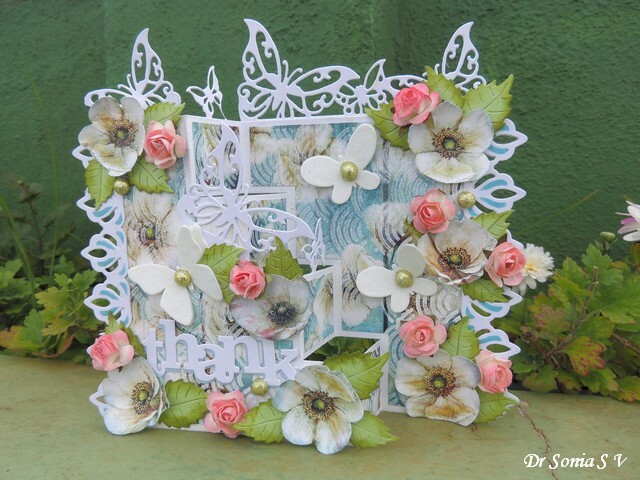 I used a lovely pattern paper from Bob n Betty but I wanted to tone down the dark colors a bit so went about altering it using white paint and Carrbelle Studio's Geometry Stencil. 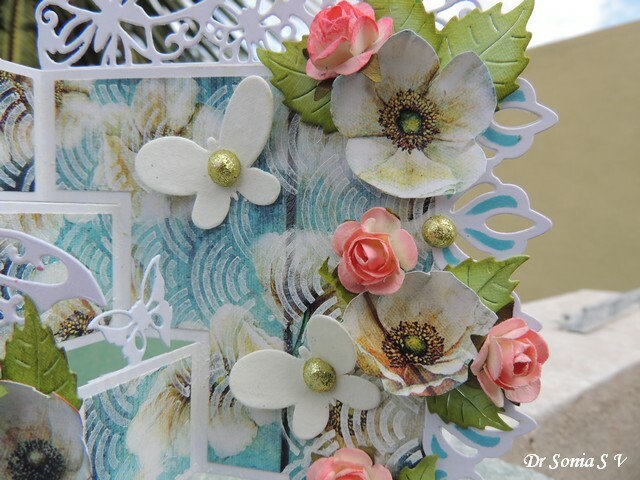 Also fuzzy cut a few flowers from the same paper and used it on my Step Pop Up Card ! The vanilla butterflies have been in my stash since years and I dressed them up with glittery thermocol balls! 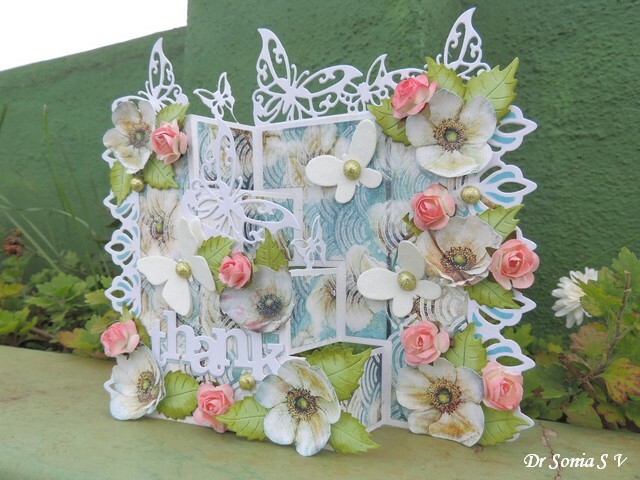 I have butterflies galore on the borders and on the steps of my step card! I hope the teacher my daughter gifts this to likes it! How A Switch Works -Teaching Kids Electricity !